ComeOn is an online sports betting company that don’t just stop there. Their services extend as far as an online casino and live casino that have been very widely received amongst punters all over the world. ComeOn first graced the scene in 2009 and since then they grown exponentially and even have a few sister sites under their belt. Unless you are from USA, Turkey or France you won’t have a problem discovering what’s in store for you at ComeOn as those are the only countries they, sadly, don’t offer a service for. For all the countries they do, you can expect to find a great list of sports markets, promotions and the chance to bet in-play on some of your favourite sports. ComeOn has one of the better websites that we have seen and reviewed and from the moment you land on the homepage you can see that a lot of time, consideration and effort has been put into making it look as nice as it does. At the very top, centre, of the page you will see ComeOns’ logo and below is the button to sign up or create an account. Underneath you can find the main navigation tool which you can use to visit their live casino, casino, in-play and promotional sections of the site. On the left hand side of the site you will find a list of some of the most popular sports, competitions and events happening and below this is ComeOns’ complete list of sporting markets which are covered. Your bet slip can be found and accessed on the right hand side of the page and it populates whilst working out your potential winnings as you go along. ComeOn offers their customers a wide array of different sporting markets to choose from, players can browse sports like Football, Tennis, Horse Racing, Ice Hockey, Basketball, Darts, Rugby Union, Aussie Rules, Badminton, Baseball, Snooker, American Football, Pool, Boxing, Cricket, Chess, Cycling, Floorball, eSports, Futsal, Golf, MMA, Handball, Motor Racing, Speedway, Rugby League, Triathlon, Virtual Sports, Water Polo and Volleyball. Once you have selected the sport you wish to proceed with, you will then be shown a list of countries that can help narrow down your selection and allow you to then choose the event, competition or game you wish to bet on. There is so much to choose from and especially if you are a football fan, you can decide on anything from the Kazakhstani PFL to the Rwandan National League and everything in between. Their football markets are also up to scratch and you can search find all the usual ones like 1×2 FT, Total Goals, Both Teams to Score, Corners, O/U Corners, Handicaps, Draw No Bet, Exact Score, O/U FT, Team Goals, Match Winner and Both Teams to Score, Goal Scorer, Winning Margin and dozens more. There isn’t a massive amount of customer orientated promotions that are directed specifically towards their sports book but for what they do have, it isn’t all that bad. To receive their welcome bonus, all you need to do is sign up and create an account with ComeOn and you will receive a £10 free bet once you have deposited and wagered £10 on any sport markets where the odds are 1.5 or greater. 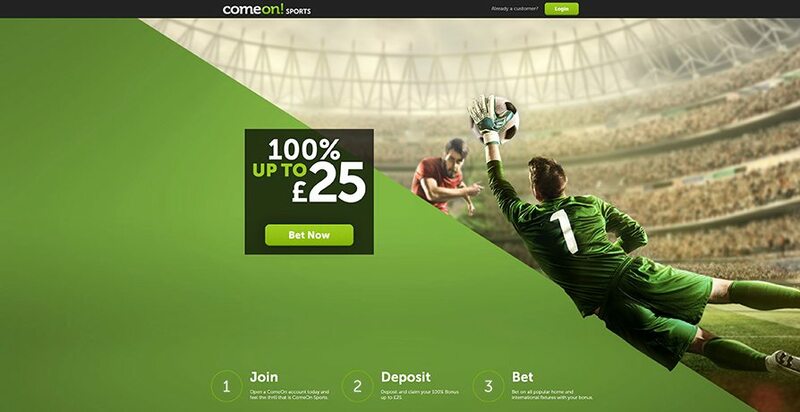 ComeOn updates their offers quite regularly so if you want the most up to date account of their running promotions it’s definitely best to check regularly on the site because you could end up with a spectacular accumulator boost or some enhanced odds. If you dabble in the realms of social media then it might be worth your time attending their football quiz that takes place every Friday at 13:00 GMT for your chance to win an exclusive £10 free bet. All you need to do is answer 3 questions correctly and they will then select 2 winning applicants at random who will receive the prize. Becoming a ComeOn customer will give you the chance to use their quality in-house in-play betting console. Here, customers will have a great range of different sports to choose from, such as Football, Tennis, Basketball, Badminton, Tennis, Ice Hockey, Snooker, Pool, Handball, Water Polo, Volleyball, eSports and Futsal. All the usual in-play markets you would expect to find have been covered by ComeOn and football fans can choose between1x2, 1st Team to Score, Both Teams to Score, Double Chance, 1 or X, Asian Handicaps, Handicaps, OU, Exact Score, Goal Crazy, Odd/Even and Last to Score. If you are someone who likes to enjoy sports betting without the restraints of being confined to a chair, in front of your desktop then you will be pleased to know that ComeOn have a mobile betting application that can be found on the Apple app store for IOS users and if you’re on Android you can find it on ComeOns’ website. The application perfectly compliments their already aesthetically impressive website and everything plus more can all be accessed from your mobile or tablet device. The application isn’t a requirement if you are struggling for storage space and by visiting ComeOns’ website from your device, will bring up a full optimised mobile version of the site. ComeOn accepts payment methods ranging from e-wallets like Entropay, Paysafecard, Neteller and Skrill as well as card transactions such as Maestro, MasterCard, Visa and Visa Electron. When you are withdrawing your winnings, depending on the option you choose will determine how long it will take for the funds to show up into your account. Bank transfers are usually the longest method and can take between 3-5 business days and e-wallets, being the faster option, usually take around 24 hours before the funds show up as available. ComeOn has a great bunch of guys operating their customer support department and all questions and queries are usually answered and addressed immediately if you contact via the live chat function, this service isn’t 24 hours a day sadly and is only available between 09:00 and 21:00. They also respond to customers via email from 08:00 through to 21:00. To round up our ComeOn review, a lot of features of this bookmaker are very praiseworthy; their website looks and feels amazing, they have a solid amount of sports and markets available to customers and great in-play console to boot. Their welcome bonus is decent enough to start with, but the best promotions are found by checking on a regular basis to see what they are offering as it gets updated depending on what events are currently occurring. We would like to see their support open hours extended to suit all types of customers and this would also put them closer to the bigger companies on the scene who have a round the clock service. Overall we are pleased with what they offer and they are definitely a site to consider using and more, so sign up below and create your ComeOn account today.